Your veterinarian will rely on your awareness of small changes in your pet's behavior or habits. As the pet owner you must communicate your pet's health care needs to your veterinarian. Nobody knows your pet like you. Many signs of illness are subtle. Your veterinarian will rely on your awareness of small changes in your pet's behavior or habits. Take the time to choose the right veterinarian for your special pet. 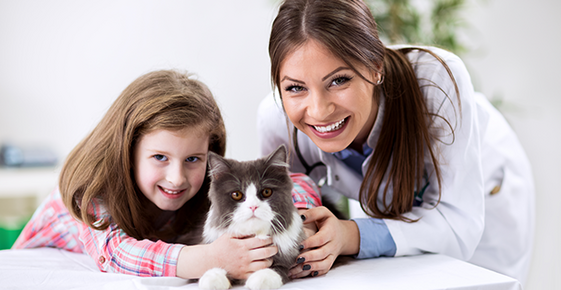 It is a good idea to start thinking about selecting a veterinarian before a new pet becomes a member of your family. In fact, a veterinarian can assist you in selecting a pet that complements your personality, work schedule and home life. If you've just moved, you will want to locate a veterinarian soon. Don't wait until your pet becomes ill; you want to establish a relationship right away. Your veterinarian can provide you with information on special climate concerns for your pet. In addition, since traveling can be a stressful experience for a pet, an early check-up may be in order.